As part of a celebration, we were eating at a highly recommended steak house. Since this was a special occasion, I ordered a dry aged ribeye steak. Prime grade, which was supposed to be the very best. There had been so much hype and marketing for this steakhouse and this cut that I thought it would be worth breaking my habit of eating grassfed meat only. Just this once. Just on this special occasion. The steak arrived. Despite the hype, it looked merely good, not great. And it did not smell like anything. I took my first bite. It was amazing. Wonderful flavor, a hint of butter, tender enough, so delicious. I wanted more. I took the second bite and chewed. Nothing. Total bleh. Without the great taste of the first bite, the poor texture and mouth feel of the steak dominated, as did the weak, almost nonexistent flavor. Or rather, the absence of flavor. I did not even want to swallow it. But I did. I was stunned. How could the first bite be so good, and the second bite be so, so nothing? Was there something wrong with me? I tried a third bite. Even more bleh than the second. I tried the potato dish that came with the steak. It tasted good. On the first, second, and third bites. Then I took my fourth bite of the steak. Even more bleh, and I was starting to really dislike what taste there was. There was nothing wrong with my taste, as the potato dish tasted good with every bite. It was the steak. But why did the first bite taste so good? Over the next few weeks, I frequently made grassfed beef steaks and roasts, and some grassfed bison roasts. Every bite was wonderful and satisfying, so much better than the highly touted steak I had at that steakhouse. And I felt much better after eating them. On several occasions, I went to other highly recommended restaurants, and tried a variety of meat and seafood dishes. Time and time again, the first bite was wonderful, the second bite was bleh, and the whole disappointing experience repeated itself. Then, we went to an old family favorite, a local restaurant which has been open since the eighties, when quality of food was very important to good restaurants. 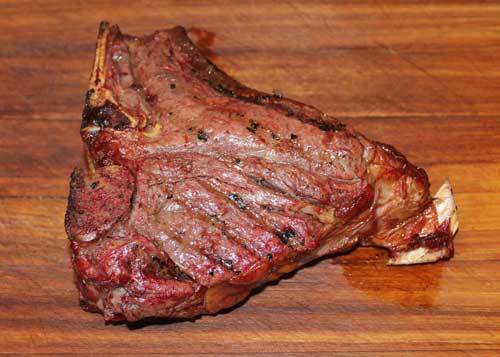 I had a grassfed T-bone steak. The first bite was absolutely wonderful, as was the second, the third, and every other bite, until the only thing left of the steak was a bare bone. I felt wonderful after eating it. I finally understood, or at least I think I do. The first bite at the other restaurants was greatly improved by flavor enhancers, and other methods used to make the food taste much better than it actually was But my senses adjusted to the flavor enhancers, or whatever was used, and somehow ignored them, so the food tasted to me as it really tasted on the second bite, and later bites. The real food, the grassfed meats, tasted good to me on every bite because they really tasted good on their own, when skillfully prepared. After eleven years of trying to eat only real foods, especially real meats, my body had learned to recognize them, and was no longer willing to accept the taste of flavor enhanced factory foods. I have communicated with other people who have had similar experiences, and it is not just me. My body is telling me what it wants, and what it does not want, and I will listen.